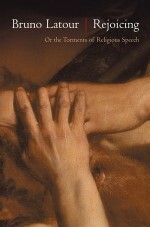 Rejoicing – or the torments of religious speech: that is what he wants to talk about, that is what he can’t actually seem to talk about: it’s as though the cat had got his tongue; as though he was spoilt for choice when it comes to words; as though it was impossible to articulate; he can’t actually seem to share what, for so long, he has held so dear to his heart; before his nearest and dearest, he is forced to cover up; he can only stutter; how can he own up to his friends, to his colleagues, his nephews, his students? He is ashamed of not daring to speak out and ashamed of wanting to speak out, regardless. Ashamed, too, for those who don’t make it any easier for him, thrusting his head underwater while claiming to rescue him, or, instead of throwing him a lifebuoy, throwing words as heavy as a mooring buoy at him. Weighted with lead, that’s it –they’ve weighted him with lead. Yes, he goes to mass, and often, on Sunday, but it doesn’t mean anything. Alas, no, it doesn’t mean anything really; it can’t mean anything anymore to anyone. There is no diction anymore for these things, no tone, no tonality, no regime of speech or utterance. It’s a twisted situation: he is ashamed of what he hears on Sunday from the pulpit when he goes to mass; but ashamed, too, of the incredulous hatred or amused indifference of those who laugh at people who go to church. Ashamed that he goes, ashamed of not daring to say he goes. He grinds his teeth when he hears the things said inside the church; but he boils with rage when he hears the things said outside the church. All that’s left for him to do is hang his head, weary, sheepish, before the horrors and misconceptions on the inside as well as before the horrors and misconceptions on the outside; it’s a double cowardice, double shame, and he has no words to express this, as though he were caught between two opposing currents, with the resultant clash leaving him whirling on the spot.